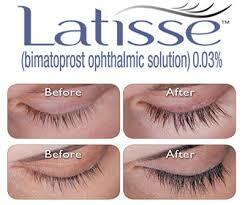 LATISSE® solution is intended for use on the skin of the upper eyelid margins at the base of the eyelashes. DO NOT APPLY to the lower eyelid. If you are using LUMIGAN® or other products in the same class for elevated intraocular pressure (IOP), or if you have a history of abnormal IOP, you should only use LATISSE® under the close supervision of your doctor. LATISSE® use may cause darkening of the eyelid skin which may be reversible. Although not reported in clinical studies, LATISSE® use may also cause increased brown pigmentation of the colored part of the eye which is likely to be permanent. It is possible for hair growth to occur in other areas of your skin that LATISSE® frequently touches. Any excess solution outside the upper eyelid margin should be blotted with a tissue or other absorbent material to reduce the chance of this from happening. It is also possible for a difference in eyelash length, thickness, fullness, pigmentation, number of eyelash hairs, and/or direction of eyelash growth to occur between eyes. These differences, should they occur, will usually go away if you stop using LATISSE®.